Our sister paper the Yorkshire Post has revealed today that punctuality in the North of England is now even worse than during the immediate aftermath of the May timetable rollout fiasco - with almost 80 trains per day being cancelled by the region’s two biggest operators and overcrowded services frequently running with reduced numbers of carriages. New analysis - published six months to the day that Lancashire Evening Post joined other regional newspapers in a One North campaign demanding urgent improvements - shows that only 62 per cent of TransPennine Express services and 67 per cent of Northern services arrived on time last month, their worst figures in the past two years. According to figures collected by the performance tracking website trains.im, the previous lowest point for TPE was in July when 65 per cent were on time, while Northern’s worst previous month was in May when 77 per cent were on time. Both operators today blamed ‘autumnal conditions’ leading to carriages needing repairs and trains needing to run at slower speeds for the problems. Over 16 per cent of TPE services last month were more than 30 minutes late or cancelled entirely, along with four per cent of Northern trains. A report to be discussed tomorrow at a meeting of Rail North, the body which manages the TPE and Northern rail franchises, separately reveals how standards have slipped back after slight improvements in the summer. It comes after MPs yesterday criticised Transport Secretary Chris Grayling, Network Rail and regional operators for the failure to prevent the chaos which ensued when major timetable changes were introduced in May. Mr Grayling told the BBC yesterday he “absolutely” accepted responsibility for “not asking the tough enough questions” after he was criticised for not being proactive enough in finding out the extent of the problems and taking action. The Rail North report reveals that an average of 40 Northern services and 39 TPE services were cancelled each day between October 26 and November 22. But the cancellation levels are not as bad as at the height of the May crisis, when Northern was failing to run more than 300 services per day. Between mid-September and mid-October, TPE ran 105 shorter trains, a problem put down to “fleet issues”. Between October 26 and November 22, Northern only had 70 per cent of trains running on time - the same percentage as the first fortnight after the May timetable rollout. 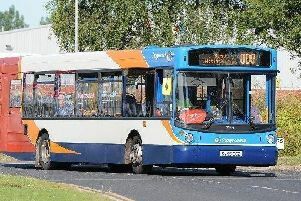 To improve reliability after the initial problems in May, Northern started an emergency interim service from June 4 which removed 168 services per day - with the 22 still yet to be reintroduced coming back from this Sunday. The change initially improved matters, with the percentage of on-time trains rising to 79.9 per cent before another decline in recent weeks. TPE’s initial performance in the first fortnight of the new timetable saw 62.9 per cent of its trains running on time, with this rising to 68.5 per cent in the summer. But in the past four weeks, it has fallen back to 66.4 per cent - far below the 80 per cent recorded at the same time last year. Talks aimed at resolving a long-running dispute about the role of guards on trains have collapsed, say union leaders. There have been several months of strike action on Saturdays on Northern services as part of the dispute over whether trains should only have a driver. It had been hoped that the issue could be solved through talks this week.